For years the only source for hunting the big and beautiful elk was to travel out west to bag your kill. Clearly not a problem for those who live out west, but for those in the east the travel requirement could be a challenge. Those days are over though. Oak Creek ranch is one of the few Elk hunting preserves in the midwest. Oak Creek has went to great measures to ensure you are not just hunting elk, but hunting trophy elk. Oak Creek prides itself on using an array of stewardship methods to grow beautiful elk, prime for hunting. Their management plan is intensive and strict and follows a set of principles for raising, breeding, and ultimately hosting a trophy elk hunt. The Missouri elk hunting season is vast among public lands, but Oak Creek only accepts a limited amount of elk hunters per year. This is a method of conservation that allows the elk species to maintain their numbers. 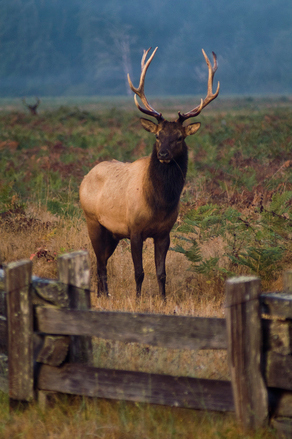 Hunting at elk at Oak Creek involves the use of a guide skilled in the measures of conservation. Our guided elk hunts help us cull older elk, and cultivates and encourages younger elk to take their place. This not only guarantees you score a trophy elk on your hunt, but is one of the reasons elk have made a return to Missouri. We are dedicated to providing our customers with a hunt that meets their satisfaction, and ensuring that we allow the Missouri elk to grow in numbers for future hunters.